Finnish Lapland is as close to Narnia as it gets. Here’s our guide to what to see and do during the winter season. Lapland, located in the northernmost part of Finland in the arctic circle, is famous for its magical Northern Lights and being the home of Santa Claus. This is especially true during the winter months when this frosty tundra is covered in a thick layer of glittering snow that blankets the pine trees. 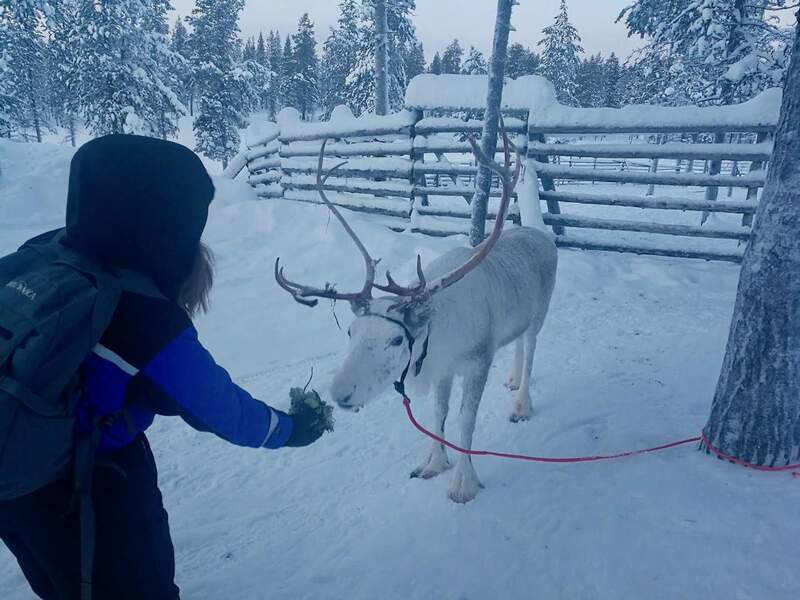 However Lapland is not just a place to take the kids to meet Father Christmas. 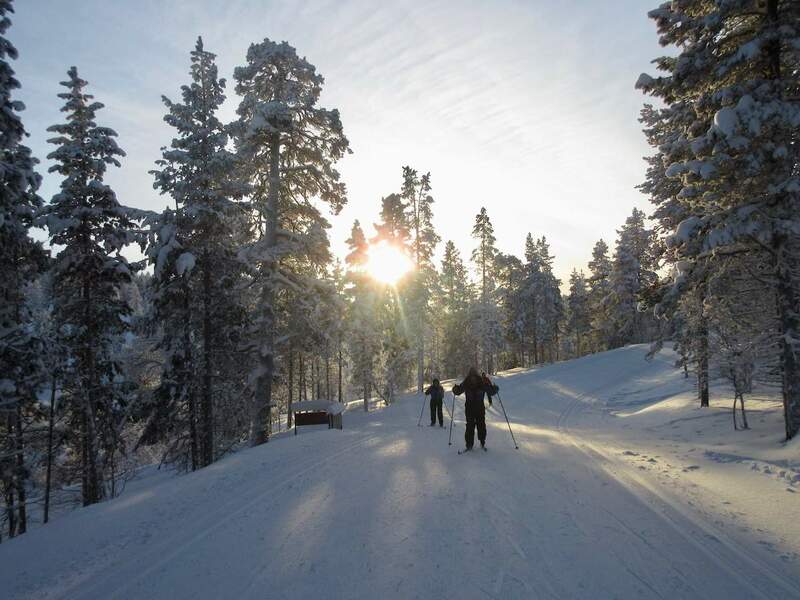 Resort villages such as Saariselka offer a huge range of winter activities right up until May. We have put together a handy list of our favourite things to see and do in this winter wonderland. 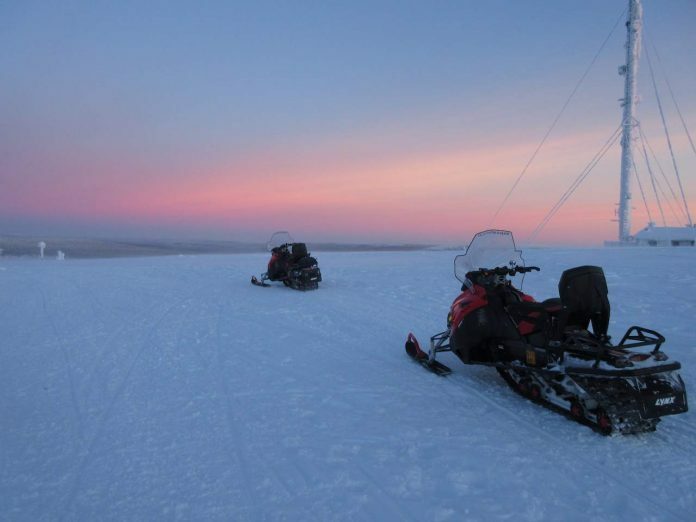 This is a fantastic way to start your adventure in Lapland as you can cover lots of ground in a relatively short time. Take a guided tour on specially ploughed paths across frozen lakes, through pine-strewn forests and atop the vast snowy expanse of the Finnish highlands. You don’t need any previous experience to drive a snowmobile, but you will need to be over 18 and have a full, clean driving license (under Finnish law). The weather can be quite unpredictable – we got caught in a blizzard and it was genuinely quite intrepid (and fun). Prices for the snowmobile safari start from £59 per person based on two riders sharing. The best way to ski in Lapland is cross-country style. By joining a group ski via a ski school you can learn how to glide through the snow – a puzzling mix of running and skating. There’s a training ring so you can practise the basic moves and then it’s time to head for the (little) hills. There are 200km of ski tracks in Saariselka, so plenty of places to hone your skills even if you inadvertently ski backwards, crash into each other and fall over a lot. Don’t worry – you never go fast enough in ski school to cause any serious injury. A ‘Learn to Cross-Country Ski’ package from £110 per adult (including three days’ tuition and seven days’ equipment hire). While a dip in temperatures below zero degrees sounds like madness, it is in fact incredibly invigorating. At the East Village of Kakslauttanen Arctic Resort, you can book one of three smoke saunas, complete with fireplace and private dressing room. A path leads from the smoke sauna to the frozen river where you take a dip down a specially cut hole in the ice – you may need to break a thin layer of ice before climbing in. For Dutch courage order some beers to your private dressing room. Trust us – you won’t regret it! They may look like tennis rackets, but snowshoes are a very effective way of navigating through the white stuff. The area of Saariselka offers excellent conditions for snowshoeing and plenty of marked trails. Book a guided tour and spend a couple of hours exploring the frozen forest – you may even spot a brown bear. Snowshoeing is a great workout, so you can enjoy a totally guiltless supper at the end of your hike. Since prehistoric time, the Sami people have occupied the northern parts of Finland, Sweden, Norway and Russia. You can learn about these struggles and more at Siida, the national museum of the Sámi. This excellent museum documents the spiritual and material culture of the Finnish Sámi, as well as their long history of persecution. 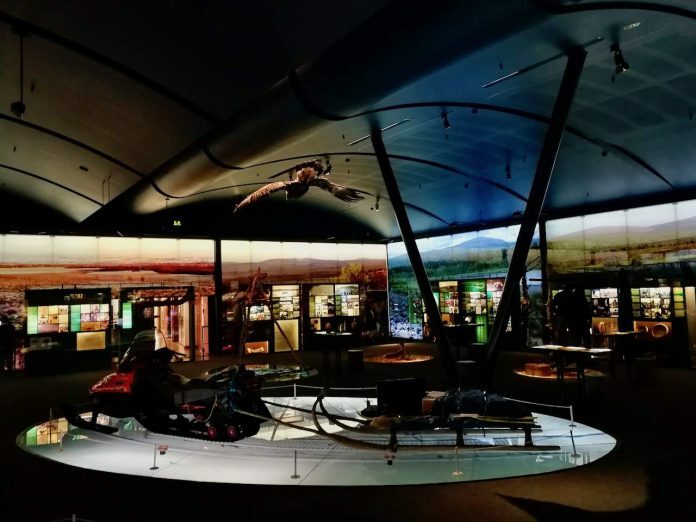 In the summer you can also explore the open-air museum, which displays a variety of Sámi dwellings as well as various hunting and fishing methods. The Sámi museum and Inari Village visit starts from £59 per person. The Sami people are best known in Lapland for reindeer herding. Visit a working farm and learn all about the reindeer, their quirky personality traits and their various uses. Just don’t ask the Sami people how many reindeer they have – it is considered very rude (like asking how much somebody earns). Reindeer are classed as wild animals and don’t like to be petted but you can feed them some lichen. During the visit you will be taken on a short ride through the forest on reindeer sleighs (two per sled). We were assured that the reindeer are very strong and pulling a sleigh for two takes little effort. The reindeer safari and farm visit starts from £49 per person. Cosy up in an Aurora Cabin at the Northern Lights Village. 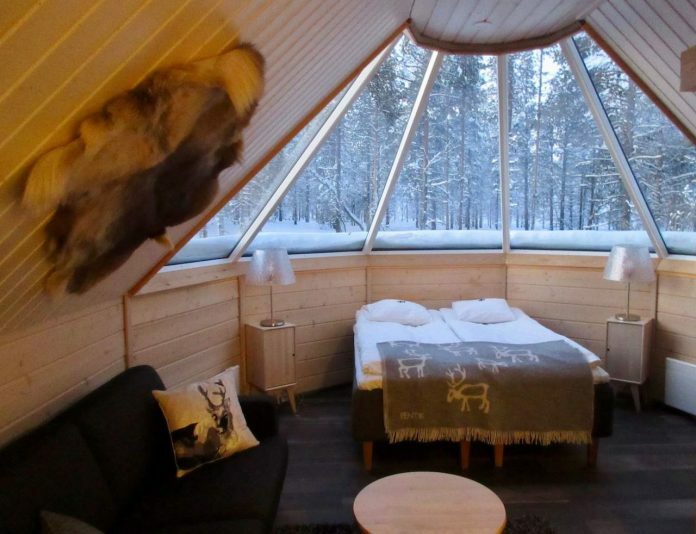 See the stars and perhaps even the Northern Lights through the gorgeous domed glass roof. Each cabin has a double bed, sofabed, bathroom and shower. The glass roof has built-in heated filaments that can be activated if it gets frozen over. One night’s stay in the Aurora Cabin starts from £199 per person. The Northern Lights Village has an ice restaurant built annually at a cost of €100,000. It is made almost entirely from ice with 2m thick ice walls. 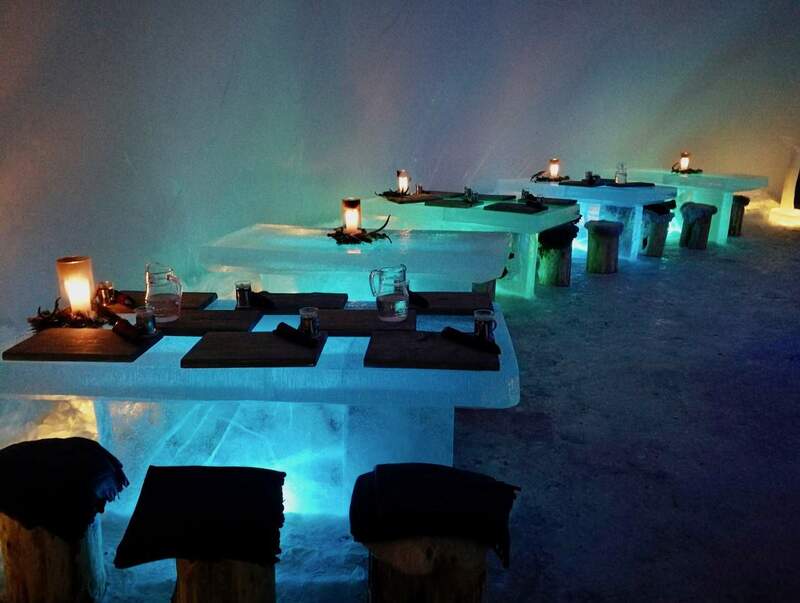 Diners get to sit on an ice throne on top of a reindeer skin alongside blue-lit icy tables. Tip: order the delicious reindeer sirloin. You must also try the classic gin & tonic with lingonberries. In April, the ice restaurant is melted down and the owner must come up with a new design the following year. A three course meal at the Ice Bar & Restaurant starts from €52 (£47). Head to one of the frozen lakes in search for the Northern Lights. You have a much better chance of seeing them in the wilderness as there is less light pollution. It can get very chilly in Lapland (sometimes -28°C) so once you feel the cold is too much, make your way into the cosy cabin on the edge of the lake and enjoy a three course meal cooked by your local guide. You’ll also be given a glass of hot lingonberry juice to warm you up. 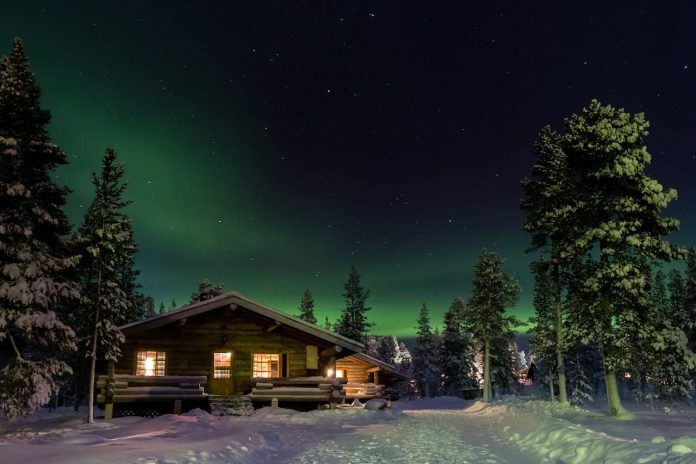 Your guide will poke his head out of the cabin periodically, just in case the Northern Lights come out while you’re tucking into your delicious meal. The wilderness dinner costs from £55 per adult. 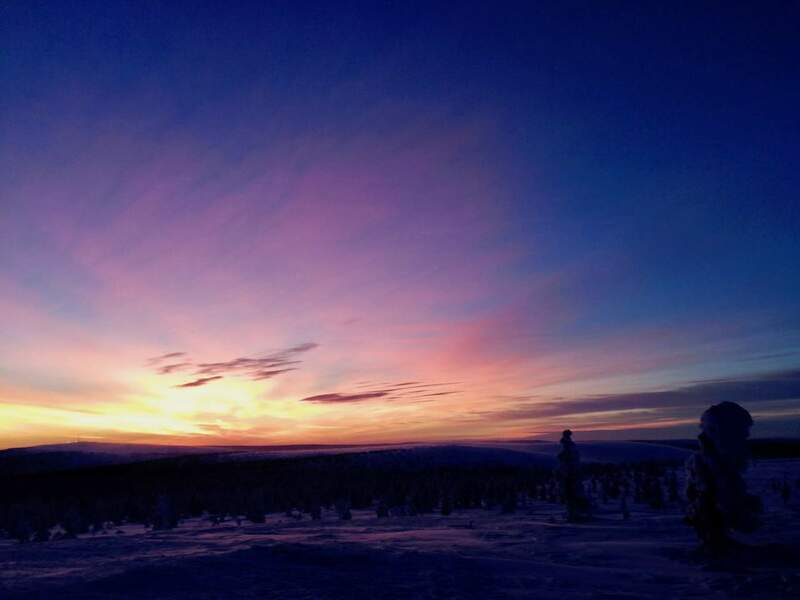 Lapland is a photographer’s dream. Everywhere you look, the frosty landscape is breathtaking and therefore highly instagrammable. Avoid taking your gloves off for too long and getting frostbite. One of the best times to take photographs is at sunset in the mid afternoon. The sky turns from icy blue to a melee of red, pink and yellow, and it’s awe inspiringly beautiful. TOP TIP: Temperatures during the winter months can drop as low as -40°C (often around -15°C) so make sure you pack lots of layers, warm gloves, hats and plenty of handwarmers. In our experience, you can never be wearing too many layers, just too few! STAY: The newly opened Star Arctic Hotel located on top of the Kaunispää mountain offers breathtaking views of Saariselka. Click here to read our review. PACKAGE: Inghams offers seven nights on half board (including daily hot buffet breakfast and evening buffet) in a standard suite at Star Arctic Hotel from £1,519 per person based on two sharing in February or March 2019. 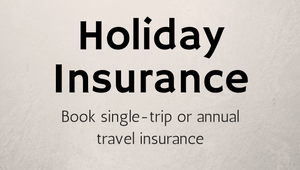 Price includes airport transfers and return direct flights from Bristol, Manchester and London Gatwick. FLY: Finnair offer direct flights from London Gatwick to Ivalo during the winter season (ending 22 March). 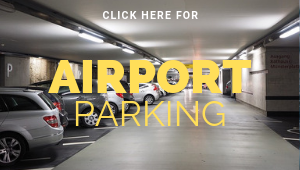 Ivalo Airport is just a 25-minute drive to Saariselka and Inghams will arrange for you to get a shuttle bus to your hotel. EAT: Finnish cuisine is hearty and delicious, with plenty of fish and red meat. 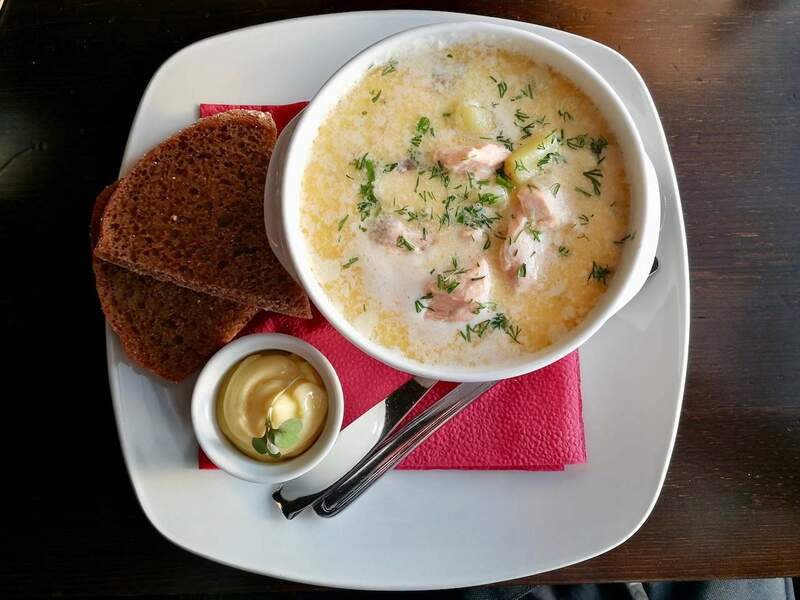 The restaurant at Holiday Club Saariselka serves a fantastic creamy salmon soup that is perfect for lunch. There is also an excellent buffet at the newly renovated Wilderness Hotel Inari, which has impressive views of the frozen lake. For dinner, we highly recommend booking a table at Laanilan Kievari, which was originally a guest house in the early 1900s. The restaurant is warm and inviting, and serves the most wonderful reindeer shoulder cooked over a roaring fire.